Is Going Gluten-Free Healthy for Everyone? Posted on March 24, 2017 | Comments Off on Is Going Gluten-Free Healthy for Everyone? People who don’t have a medical reason, such as celiac disease, wheat allergy or gluten sensitivity, are going gluten-free for a variety of reasons. Some hope that avoiding gluten will foster weight loss, boost energy or improve general wellbeing. Those with celiac disease, who must avoid even trace amounts of gluten to preclude potentially life threatening intestinal damage, will tell you that eliminating gluten involves more than simply giving up all things wheat, including bread, pizza, and beer. Gluten, a composite of two proteins with viscoelastic properties, is also found in rye, barley, triticale, and in a host of processed foods, as well as in some very unexpected places like salad dressings, candy, medicines, and cosmetics. While statistics show that approximately 1% of the population suffers from celiac disease, an unknown percentage may have non-celiac gluten sensitivity. This condition often has similar symptoms of digestive upset, abdominal pain and bloating, but without the intestine-damaging immune response of celiac. For many, eliminating gluten can lessen these adverse effects. A gluten-free diet may also be helpful for those with other inflammatory disorders, such as irritable bowel disease, leaky gut and certain autoimmune diseases. Often those who decide to totally exclude, or perhaps eat fewer gluten containing products, do lose weight and feel better overall. Some argue that this has nothing to do with gluten elimination, and has everything to do with avoiding bagels and cookies. A steady diet of refined carbohydrates and junk foods promotes weight gain, diabetes and chronic disease. When replacing high glycemic wheat-based products with whole fruits and vegetables, one is likely to drop a few pounds, and feel healthier and more energetic. However, swapping gluten containing baked goods for gluten-free baked goods is not likely to result in weight loss or improve health and function, as manufactured gluten-free foods are not inherently healthier for you. Adhering to a gluten-free diet, whether medically necessary or not, requires strict diligence, not only for gluten avoidance, but to ensure adequate intake of fiber, nutrients, and minerals necessary for optimal function. Manufacturers, of course, are more than willing to provide gluten-free products, which has made life easier for those who absolutely must avoid gluten. Unfortunately, industrially produced gluten-free foods are often made with refined grains, unhealthy fats, high levels of sodium, and lots of added sugar. Nutrients? Not so much. Studies show that gluten-free diets can be deficient in fiber, iron, folate, niacin, thiamine, calcium, vitamin B12, phosphorus and zinc. The popular gluten-free eating trend has gained momentum and shows no sign of abating. 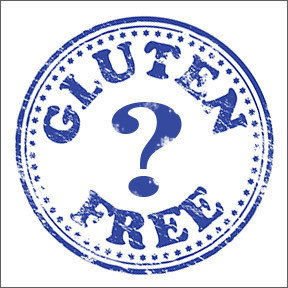 If you choose to follow a gluten free diet, be sure to include minimally processed, naturally gluten-free foods, such as quinoa, cornmeal, or buckwheat, rice, lean meat, dairy, seafood, fresh eggs, beans, legumes, nuts, fruits, and lots of vegetables. Abstaining from gluten can improve an unhealthy diet, if you don’t succumb to eating processed gluten-free foods. However, you do lose the potential disease fighting benefits of whole grains, including a lowered risk for heart disease, obesity, and colon cancer. One might wonder if gluten has replaced fat as the new dietary villain. Research shows that 30% of American adults claim to be reducing their gluten intake or eliminating it completely, a number that is way out of line with statistics on celiac disease. In the absence of disease, the medical community has not reached a consensus on the health effects of a gluten-free diet. Some published research revealed that gluten may be playing a harmful role in altered gut function and microbiome modifications. Others argue that gluten proteins boost immune function by increasing natural killer cell activity, improving the body’s ability to fight cancer and viral infections. As with most dietary advice, it comes down to personal choice. One way to test a gluten-free diet’s ability to improve wellbeing is to eliminate gluten and wheat-based products for 30 days. After one month, make note of any changes, then add one gluten containing product back into the diet. If, after 3 – 4 days, you feel the same or feel worse, you’ll have your answer. If you do react negatively to gluten, it’s quite possible that a healthy gluten-free diet would be appropriate for you. Just steer clear of the many gluten-free processed foods and stick to whole, nutrient-dense, naturally gluten-free foods. Additionally, read labels for hidden sources of gluten, and pay closer attention to meal planning and nutrient intake to ensure you are getting adequate amounts of essential vitamins, minerals, phytonutrients, antioxidants and fiber. GlutenEase™ by Enzymedica: GlutenEase™ supports digestion and assimilation for the gluten or casein intolerant, and assists in normalizing the gluten peptide’s inflammation response. Gluten, dairy, wheat, soy, and casein free vegan formulation. Gluten Support Packs™ by NuMedica: These daily packets provide 5 advanced nutritional formulas for support of gluten related gastrointestinal issues, as well as daily immune system maintenance. Gluten, wheat and soy free formulation. SpectraZyme® Gluten Digest by Metagenics®: This product provides clinically tested, targeted support for the enzymatic breakdown of gluten proteins before reaching the small intestine, and supports the healthy digestion of wheat, barley, rye and other gluten sources. Gluten free, Non-GMO vegan formulation. Gluterase™ by Biotics Research: Designed for consumption along with a gluten-free diet, Gluterase™ provides specific nutrients shown to digest and inactivate gluten, and support gastric health and efficacy. Gluten and dairy free formulation. This entry was posted in Home and tagged Gluten Support Packs™ by NuMedica, GlutenEase™ by Enzymedica, Gluterase™ by Biotics Research, Is Going Gluten-Free Healthy for Everyone?, SpectraZyme® Gluten Digest by Metagenics. Bookmark the permalink.